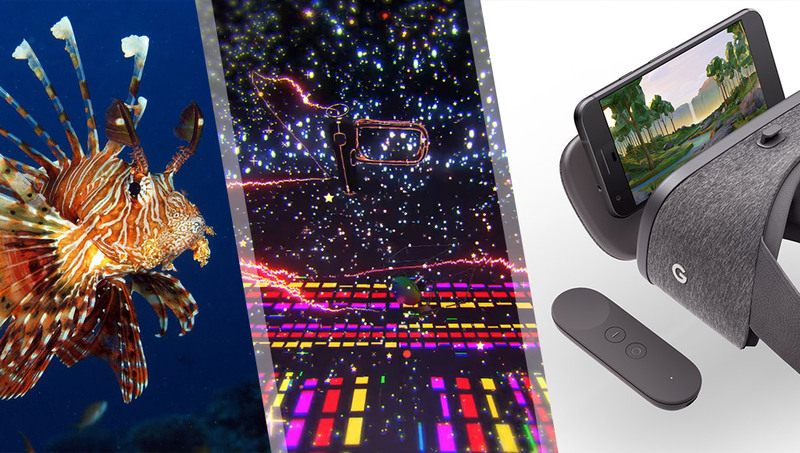 This week, Google announced their Daydream view headset and Google Home devices, they also open-sourced a toolkit for people to interpret Tilt Brush files (seriously cool! ), Arduino has reunited and we’re taking on lionfish using killer robots! Robots are coming for you lionfish. Seriously. Yet another great example of using virtual reality for some groundbreaking advances. Google’s Daydream VR headset was announced today! Most articles on the web don’t seem to explain much. This one by Ars Technica covers the most. Also, if you pre-order their new Pixel phone, you might be able to get a free headset. The Google VR SDK 1.0 with Daydream support is now available on the Daydream developer site too, so get experimenting guys and gals! It is a set of scripts that people can download for free on GitHub that allow developers and creators to interpret .tilt files. Things are gonna get super cool, super fast. A pretty neat device that allows you to take spherical panoramas on your smartphone! They also have super compact (and cheap!) Google Cardboard style viewers. An interesting report on the future of virtual reality from IAB, a variety of findings that might be handy to know! This Vive Twitch replay was pointed out to me by Mikkel, only really visible briefly but the Vive owner has constructed a fancy rig to handle his Vive cord! Xbox’s new wireless controller will be compatible with Samsung’s Gear VR, the first game it’ll be compatible with — Minecraft: Gear VR Edition. Luke Stone, the director of Google’s Customer Reliability Engineering team, wrote a blog about keeping Pokemon Go’s servers running. Fast Company say the dual cameras were most likely meant only to create better photographs, not detect 3D content for AR apps. I guess that’s a better option right? Hard to tell right now whether they’re trying to avoid bad news making things worse or whether their difficulties are being overblown. It’s coming next year, here’s a look at what it’ll include. These “Skryf robots” by write poetry with sand that fades away shortly after. The company that makes Roomba vacuums, iRobot, has gone in a totally new direction — they’re now creating a robot to target and kill invasive lionfish. Google thinks artificial intelligence is up to the task of flying its internet-delivering balloons through the stratosphere. Apple is expanding their efforts to get solid artificial intelligence resources into their organisation by acquiring TupleJump. Will Google’s answer to Siri lodge in our brains the way its search box did? Google’s Assistant could make search more useful but disrupt the company’s business model. It’ll be fascinating to see how they’ll adapt… they’re going to figure that bit out later. Asteria is a hardware and software platform for AI with an early dev kit available for pre-order! Pre-orders will get early access to the Asteria platform and will be one of the first in their Collectors program. Some clothing makers are hoping to end the massive parts of garment-making process that are done by hand by bringing in robots! Build a socialbot on Alexa that can have an intelligent conversation about pop culture and news events and win the big prize! Filip Zalio from Hydrix will be speaking at YOW! Connected today about designing an IoT service effectively, so I got in early to find his tips! A look at how the officially announced Google competitor to the Echo is different. Not up to speed on what the Google Home is at all? Here’s a thorough guide. The ESLOV IoT Invention Kit is an official Arduino product that adds Internet of Things capabilities to your hardware products in a nice, modular way. Two Arduino groups become one once again! They’ve resolved their differences and will ease the confusion. Phew. If you missed the drama, never mind! This is a super cool looking breadboard with an built-in Arduino-compatible inside! No need for messy cables connecting your Arduino to your breadboard… nice and simple! It’s compatible with Arduino shields, LEGO® bricks and native USB support. The security tsunami of the Internet of Things is coming, are you ready? TechRepublic discussed the “tug of war between convenience and privacy” in IoT and its associated security concerns. Ransomware is a pretty big deal these days. Here’s a look at ransomware in the Internet of Things… yikes. London just got its own dedicated IoT network, it’s now part of the LoRaWAN Things Network family! What’s holding you back from being the developer you want to be? How could Dev Diner help? Snapchat me (devdiner), DM me on Twitter or just send me an email and let me know!